The enjoyment of physical activity is an important aspect of the Physical Education and Athletic program at St. John’s Episcopal School. The program encourages students to participate and exposes them to a variety of activities that are both competitive and non-competitive in nature. At all levels, physical fitness activities encourage the children to challenge themselves and set individual goals. An appreciation for teamwork and good sportsmanship is emphasized in class and team activities. 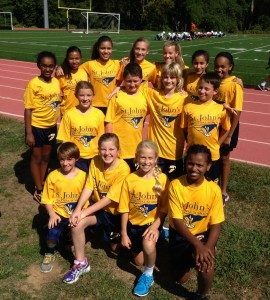 The athletic portion of the St. John’s program focuses on building enthusiasm for fitness and teamwork. We encourage students to have a healthy view of competition and the teamwork that it takes to enjoy competition through successes and failures. All students, regardless of their abilities, are encouraged to participate in our program. The measure of our success is not how many victories we earn, but in the character that is built from our commitment to teamwork. Participation in team athletics is ultimately an expression of one’s ability to work with others; it is a commitment to building community. Students who participate in athletics at St. John’s are expected to make a sincere commitment to the team. This means regular attendance at practices and games. Most commitments take place after school. Parents need to help by not over-committing their children to other activities and events during the scheduled time period. Decisions about practices, games, and sports offerings are made by the school athletic staff in regards to this commitment. We strive to offer a structured, safe, and fun learning environment for our students while maintaining the integrity and sportsmanship that characterize St. John’s Episcopal School’s athletic program.